BugE - More than a bike, less than a car: More cowl wiring. Understanding how the wiring harness works is key. What worked best for me was to re-draw the wiring diagram to include changes such as noting pin-outs for my connectors, recording where my speedometer taps should go and where wires change color. Making such a diagram now will make troubleshooting future problems much easier. Once I had my diagram re-drawn, I then started from the back of the vehicle and worked forward. Mounting the tail light was done by attaching 6" angle brackets using four 1 1/2 - 1/4-20 hex bolts. 8 washers were used as spacers. Note: When picking up angle brackets, make SURE holes line up with each other as these brackets appear to be made in batches with holes in slightly different places! The tail light needed a 3rd wire added to the body of it for a ground wire. Then the three wires were connected with electric tape wrapped crimp-on spade connectors to the harness. The rear turn signals were easier to connect since they happened to have crimp-on bullet style connectors that matched the harness wires. The Trimlock starts from a point on the left and wraps around to an identical stopping place on the right. However, it cannot go across the dashboard area since the faring bulkhead and faring lip now are riveted together. Once pushed on the cowl lip, it will be modified as below. The stock wiring harness was fed from the tail light area under the cowl lip to the front of the dashboard. To hold the wiring up, I used 6-32 machine screws with nuts and some home made sheet metal straps. The screws were installed along the cowl lip so the screw heads would be under the Trimlock. 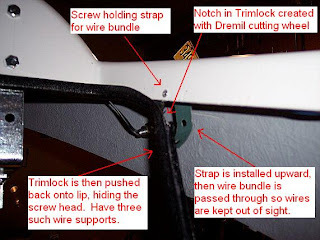 To put the trimlock back on, the non-visible part of the trimlock needed to be notched with a Dremil cutting wheel so the head of the screw was still covered but the rear of the screw could pass through. Midway down the lip, there are two brake indicator wires for controlling the rear brake light. These wires were extended so they can reach the two hand brake switches on the handlebar. This pair will end at a 2-pin connector, meeting another on the control stick, that will go on to the handlebar hand brake switches. I wish I could say I was a neat organized wiring guy but the reality is that modifying the harness to the BugE was a truly messy business. Each component was soldered onto the harness as per my wiring diagram. Originally, I was going to solder all connections. However, in the interest of time, I finally resorted to using wire taps for the speedometer indicator wires. Although it looks messy, the wiring is not really that complicated. Once I decide on the final dashboard layout, I'll shorten some of the wires to make this look better. In the middle of the shelf, you can see the rear of the 48V meter. Next to it is a black switch for the fan. In the middle there are now some connectors. A 9-pin (lights), 12pin (speedometer) are installed. The red and yellow wires are for a 2-pin (brake light) connector ready to plug into the control stick. Along the right (driver's side left) are wires that are on their way to the chassis. Also in this bundle will be a 48V pair of wires for the battery meter. Also, a wire pair will be run for the horn too since the horn will be mounted to the battery tray. The throttle cable will also run along this path, to be connected once the cowl is mated with the rest of the car. Finally, it was time for testing. Turn signals worked as did the brake light. Headlights worked and the speedometer lit up a nice luminescent blue. The BugE seemed to come to life! I only had two problems. First, on the speedometer,I wanted the hazard indicator to turn on when the brakes were applied. Instead, I got the high-temperature indicator. This was understandable since the speedometer wire bundle had light purple & a grayish purple that are easily confused. Then, I discovered my vent fan was wired backwards (it has polarity). 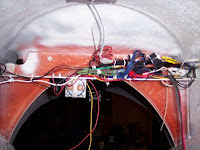 After fixing both issues, the wiring was then tucked above the shelf & zip tied to it. The end result? Some nice lighting of course! Not only do the lights work, but the speedometer also displays the status of the lights too! Assorted medium size Zipties (I find I use this size the most). Copper wire in colors red, black, yellow & blue. Redraw cowl wire diagram (noting wire color changes & tap locations) - 1:30 minutes. Mount tail light - mark & drill mounting holes, then mount tail light - 30 minutes. Extend brake light wires & solder/heat shrink headlight, mirror lights/fan (solder pen warm-up time included) - 1 hour. Add speedometer wire harness taps as per new wire diagram - 30 minutes. Trim lock notches, drill mount holes, run wire through strap - 1 hour. Troubleshoot & Redo polarity problem on fan - 15 minutes. Mating the cowl to the frame.